CAUTION--chance of sell out HIGH. From what I can recall, every mouth i've seen try this skinny snack quickly replied with a "YUM!!" Nine out of ten times I step into Trader Joes, this yummy item, along with the Spicy Ranchero version, are almost completely sold out! It's creamy, but not thick; filling, but not heavy; delicious, but guilt free. With a high protein content (14g total!) along with low calories (100 total!) it's no wonder these tasty snacks/meals fly off the shelves faster than you can burn the 100 calories! Throw your 100 calorie snack bags away, as the convient container makes it easy to carry on the go. Call me skinny, but egg white salad needs to find a way to your mouth ASAP. I live in Brooklyn, NY and frequent LA, California and they have way better egg white salad. 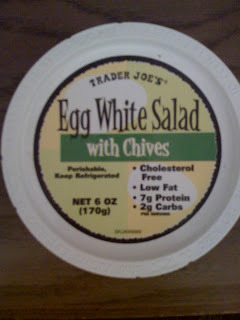 The Brooklyn TJ's egg white salad is terrible. Every time I'm in LA I buy at least 5 of each flavor when I'm there and eat it the whole time. Please make the Brooklyn/NYC TJ's get the recipe right. Thanks! Do you know if the spicy ranchero version is sold in eastern Pennsylvania? Went today and all the staff had ever seen in our store was the chive one! I just tried the Spicy Ranchero version yesterday for the first time, and I was super impressed! Even more so when I noticed the low calorie count (it doesn't taste low calorie...)! I will definitely be buying more of this for sure. Oh my gosh i love love love!! but is it only available in spring/summer monthes? Since one of the first listed ingredients is canola oil, and so much of canola oil is genetically modified, I'm wondering if it's organic canola oil. I'm working diligently to avoid gmo's.